Stance Rear subframe conversion bushings allow S14 or S15 Rear subframe to bolt on to S13 chassis. The preferred S15 subframe has better reinforcement, better toe and camber curves, as well as improved anti-squat geometry. This bushing also raises the subframe by 10mm, aiding in roll-center for lowered vehicles. 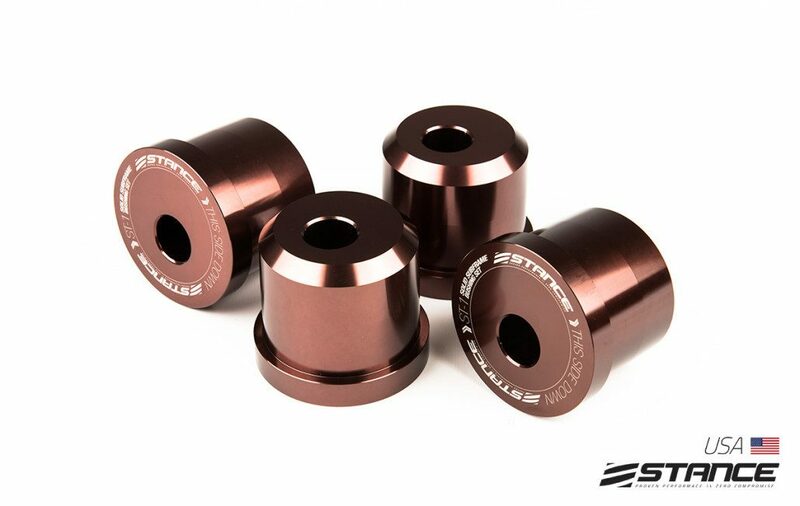 Additionally, replacing tired and old rubber bushings with these solid anodized aluminum bushings will result in better suspension feel and response that a driver yearns for. With rubber bushings, especially old and worn ones, a large amount of suspension dynamics is compromised when the energy is transferred to the shifting subframe instead of being directed towards the dampers. STANCE solid aluminum conversion bushings address this often overlooked problem.